Mast cells are critical for allergic reactions, but also for innate or acquired immunity and inflammatory conditions that worsen by stress. Corticotropin-releasing hormone (CRH), which activates the hypothalamic-pituitary-adrenal axis under stress, also has proinflammatory peripheral effects possibly through mast cells. We investigated the expression of CRH receptors and the effects of CRH in the human leukemic mast cell (HMC-1) line and human umbilical cord blood-derived mast cells. We detected mRNA for CRH-R1α, 1β, 1c, 1e, 1f isoforms, as well as CRH-R1 protein in both cell types. CRH-R2α (but not R2β or R2γ) mRNA and protein were present only in human cord blood-derived mast cells. CRH increased cAMP and induced secretion of vascular endothelial growth factor (VEGF) without tryptase, histamine, IL-6, IL-8, or TNF-α release. The effects were blocked by the CRH-R1 antagonist antalarmin, but not the CRH-R2 antagonist astressin 2B. CRH-stimulated VEGF production was mediated through activation of adenylate cyclase and increased cAMP, as evidenced by the fact that the effect of CRH was mimicked by the direct adenylate cyclase activator forskolin and the cell-permeable cAMP analog 8-bromo-cAMP, whereas it was abolished by the adenylate cyclase inhibitor SQ22536. This is the first evidence that mast cells express functional CRH receptors and that CRH can induce VEGF secretion selectively. CRH-induced mast cell-derived VEGF could, therefore, be involved in chronic inflammatory conditions associated with increased VEGF, such as arthritis or psoriasis, both of which worsen by stress. Mast cells are ubiquitous in the body and are critical for allergic reactions due to their secretion of numerous vasoactive molecules and cytokines (1). Increasing evidence indicates that mast cells are also involved in innate and acquired immunity (2), as well as in neuroinflammatory conditions such as those affected by stress (3); these include asthma, arthritis, atopic dermatitis, and multiple sclerosis. Stress stimulates the hypothalamic-pituitary-adrenal axis through the release of corticotropin-releasing hormone (CRH),4 which activates behavioral, autonomic and endocrine responses, leading to secretion of glucocorticoids that down-regulate immune responses (4). CRH, however, is also secreted outside the brain where it exerts proinflammatory effects of stress apparently mediated through mast cells (5), possibly through direct activation of CRH receptors (6). CRH exerts its effects by binding to specific cell surface receptors, of which two receptor subtypes, CRH-R1 and CRH-R2, have been characterized in human (7, 8), rat (9), and mouse (10). CRH-R1 and CRH-R2 share high sequence homology and belong to the family of seven transmembrane G protein-coupled receptors, stimulation of which activates adenylate cyclase, resulting in elevation of cAMP levels (11). A number of isoforms of the human CRH-R1 (1α, 1β, 1c, 1d, 1e, 1f, and 1g; Refs.7 , 12 , and 13) and three of the human CRH-R2 (2α, 2β, and 2γ; Refs.14, 15, 16) have been described, each containing different numbers of exons. Both receptor subtypes differ in tissue distribution: CRH-R1 predominates in brain, pituitary and skin, whereas CRH-R2 is present in brain, heart, and skeletal muscle (17). Binding sites for CRH have been reported on adherent splenocytes (18), T lymphocytes (19), and monocyte-macrophages (20). CRH-R1 and CRH-R2 expression was reported in granulocytes and lymphocytes, especially in inflamed s.c. tissues (21). CRH-R1 mRNA expression had been reported in the human leukemic mast cell line (HMC-1) (5). Mast cells in inflamed human synovial tissue were reported to express immunoreactive CRH-R1 (22). However, the expression of CRH receptor subtypes and their isoforms on mast cells are still poorly characterized. Moreover, no direct effect of CRH on human mast cells has been documented to date. Acute restraint stress was shown to induce skin mast cell activation, an effect inhibited by a CRH receptor antagonist and the “mast cell stabilizer” sodium cromoglycate (cromolyn) (23). CRH also activated skin mast cells and induced mast cell-dependent vascular permeability in rodents (5). In addition, it was shown that i.p. CRH administration reproduced stress-induced colonic epithelial ion permeability changes in rats (24), whereas i.v. or intracerebral injection of CRH in nonstressed rats reproduced stress-induced colonic mucus release (25); these responses in both systems were blocked by a CRH receptor antagonist and the mast cell stabilizers doxantrazole or lodoxamide. However, none of these findings were shown to be mediated by a direct effect of CRH on mast cells. Mast cell-derived molecules that could increase vascular permeability include the well-known granule-stored histamine and tryptase (26), which would have an immediate action, as well as the newly synthesized vascular endothelial growth factor (VEGF) (27, 28) that could participate in delayed responses. In addition to vasoactive mediators, mast cells also secrete numerous proinflammatory cytokines, such as IL-6, IL-8, and TNF-α (1, 2). Interestingly, human mast cells were recently shown to synthesize and secrete large amounts of CRH (29), suggesting this peptide could regulate mast cells through CRH receptor in an autocrine manner. We show by RT-PCR for the first time that both HMC-1 cells and human umbilical cord blood-derived mast cells (hCBMC) express mRNA for multiple CRH-R1 isoforms, whereas the latter also express CRH-R2α. CRH-R1 and CRH-R2 protein expression were also detected by Western blot analysis. Moreover, CRH induces selective release only of newly synthesized VEGF through CRH-R1-dependent activation of adenylate cyclase and significant increase of intracellular cAMP. CRH, urocortin II, and urocortin III, as well as antalarmin and astressin 2B were purchased from Phoenix Pharmaceuticals and were dissolved in dH2O on the same day of the experiments. Forskolin, 8-bromo-cAMP, isobutyl-1-methylxanthine (IBMX), PMA, calcimycin A23187, actinomycin D, and cycloheximide were purchased from Sigma-Aldrich. SQ22536 was purchased from Calbiochem-Novabiochem. HMC-1 cells were kindly supplied by Dr. J. H. Butterfield (Mayo Clinic, Rochester, MN) and were cultured in IMDM (Invitrogen Life Technologies) supplemented with 10% (v/v) bovine calf serum (HyClone Laboratories), 100 U/ml penicillin/streptomycin, and 2 μM α-thioglycerol. Cells were kept under a humidified atmosphere of air/CO2 (19:1) at 37°C. Human cord blood was obtained from human placentas from normal vaginal deliveries in accordance with established institutional guidelines. hCBMC were derived by the culture of CD34+ progenitor cells as previously described (30) with minor modifications. Briefly, mononuclear cells were isolated by layering heparin-treated cord blood onto Lymphocyte Separation Medium (ICN Biomedicals/Cappel). CD34+ progenitor cells were isolated from mononuclear cells by selection of cells positive for the AC133 Ag (CD133+/CD34+) by magnetic cell sorting (Miltenyi Biotec). For the first 4 wk, CD34+ cells were cultured in IMDM supplemented with 0.55 μM 2-ME, 100 mg/L insulin-transferrin-selenium, 0.1% BSA (Sigma-Aldrich), 100 U/ml penicillin/streptomycin, 100 ng/ml human recombinant stem cell factor (Amgen), and 50 ng/ml IL-6 (Chemicon International) at 37°C in 5% CO2 balanced air. After 4 wk of culture, BSA and insulin-transferrin-selenium in the culture medium were substituted with 10% FBS (Invitrogen Life Technologies). Human HaCaT keratinocytes and the human melanoma SKMEL188 cell line (13, 31) were obtained from Dr. A. Slominski (University of Tennessee, Memphis, TN), and were cultured according to donor protocol. The purity of hCBMC in culture was determined by immunostaining for mast cell specific tryptase, as well as by May-Giemsa staining as previously described (30). In our cultures, by 12 wk 100% of the cells were identified as mast cell. The mouse anti-human mast cell tryptase mAb was purchased from Chemicon International. Total RNA was prepared from HMC-1 and hCBMC (100% mast cell purity) collected by centrifugation and lysed in 1 ml TRIreagent (107 cells/ml; Sigma-Aldrich) according to vendor instructions. First-strand cDNA synthesis was performed from 2 μg of total RNA using 200 U/μl Moloney Murine Leukemia Virus Reverse Transcriptase, 50 pmol/μl random hexamer oligonucleotide primer, 40 U/μl RNaseOUT recombinant RNase inhibitor (Invitrogen Life Technologies) and 10 mM dNTP (Roche Diagnostics). The reaction (20 μl) was run at 75°C for 5 min, 23°C for 10 min, 42°C for 45 min, and inactivated by heating at 95°C for 10 min. A total of 2 μl cDNA was used for PCR amplification. Oligonucleotide primers of previously published sequences for CRH-R1 and CRH-R2 isoforms (Table I⇓) were used (13, 32). Positive controls included human brain pituitary cDNA and the human melanoma SKMEL188 cell line cDNA for the CRH-R1 isoforms (13), human brain cerebral cortex cDNA for CRH-R2α (8), and human brain hippocampus cDNA for CRH-R2β and CRH-R2γ (16). PCR was performed in 50-μl volume containing 2 μl of cDNA, 0.2 mM of each dNTP, 2.5 U of TaqDNA polymerase (Invitrogen Life Technologies) with 1× PCR buffer and 15 pmol of each primer. The conditions for amplification were as follows: denaturation at 94°C for 1 min, primer annealing at 61°C for 1 min, and extension at 72°C for 1 min. Each PCR sample underwent a 40-cycle amplification. PCR products generated were visualized on a 2% agarose gel, stained with ethidium bromide, and viewed on a UV light box. Nested PCR was performed to detect different CRH-R1 isoforms. The specific oligonucleotide primers previously published (13) to amplify human CRH-R1 exons 2–7 and exons 9–14 are listed in Table II⇓. The products of the first PCR served as a template for the second round of amplification reaction. Two rounds of PCR were conducted successively in a 25-μl volume containing 2 μl of DNA, 0.2 mM each dNTP, 1.25 U of TaqDNA polymerase with 1× PCR buffer, and 20 pmol of each primer. The mixture was heated to 94°C for 2.5 min, and then amplified for 35 cycles: 94°C for 30 s (denaturation), 65°C for 45 s (annealing), and 72°C for 1 min (extension). PCR products generated were visualized on a 2% agarose gel, stained with ethidium bromide, and viewed on a UV light box. Human brain pituitary, cerebral cortex, and hippocampus cDNA was purchased from BD Clontech. hCBMC (100% mast cell purity), HMC-1, and HaCaT cells were collected, lysed, and prepared for Western blot analysis. Samples were resolved on 10% SDS-PAGE and then transferred to polyvinylidene difluoride membranes (Bio-Rad). The membranes were incubated with goat anti-human/rat/mouse CRH-R1 that specifically recognizes CRH-R1, and goat anti-human/rat/mouse CRH-R2 that specifically recognizes CRH-R2, respectively (Santa Cruz Biotechnology) at a concentration of 1/1000 overnight at 4°C. As a negative control, the primary Abs were preabsorbed with synthetic receptor blocking peptides (1 μM; Santa Cruz Biotechnology). Following stripping and washing, the membranes were incubated with bovine anti-goat HRP-conjugated serum (Santa Cruz Biotechnology) at a dilution of 1/10,000 and anti-biotin HRP-conjugated Ab at a dilution of 1/1000 for 1 h at room temperature. The protein bands were detected using ECL reagent (Bio-Rad). HMC-1 (40 × 106 cells) or hCBMC (20 × 106 cells) were collected, washed once in PBS, and homogenized with Polytron homogenizer (Kinematica) in 500 μl of extraction buffer A (50 mM Tris, pH 7.4, 2 mM EGTA, 2 mM DTT, 0.5 mM PMSF, 1 μg/ml aprotinin, 1 μg/ml leupeptin). The homogenates were then centrifuged at 500 × g for 10 min at 4°C. The supernatant (plasma membrane and cytosolic fractions) was removed and centrifuged at 100,000 × g for 60 min at 4°C and the resulting pellet (plasma membrane) was solubilized in the extraction buffer A containing 1% Triton X-100. The supernatant was collected as the cytosolic fraction. The pellet from the initial 500 × g spin (nuclear fraction) was resuspended in extraction buffer B (10 mM Tris, pH 7.4, 100 mM NaCl, 1% Triton X-100, 0.1% SDS, 1 mM EDTA, 1 mM EGTA, 1 mM PMSF, 1 μg/ml aprotinin, 1 μg/ml leupeptin) and microcentrifuged at high speed for 10 min. Supernatant (nuclear fraction) was collected. Protein concentration of all fractions was determined by Bio-Rad protein assay. Equal amounts of protein were run on 10% SDS-PAGE as described. HMC-1 or hCBMC were washed with culture medium and incubated (1.5 × 106 cells/ml) for 20 min at 37°C in stimulation buffer (IMDM containing 1 mM of the potent phosphodiesterase inhibitor IBMX and 10 mM MgCl2). After centrifugation, cells were resuspended in stimulation buffer and incubated with human CRH, urocortin II, or urocortin III (100 nM) at 37°C for the indicated time points. The single concentration of 100 nM was chosen because preliminary results (data not shown) indicated that it induced the strongest response. The reaction was terminated by addition of 0.3 M HCl and the cells were frozen-thawed twice to release cAMP. The amount of cAMP released from the HMC-1 and hCBMC was estimated using a RIA kit (Biomedical Technologies). For histamine and tryptase measurements, hCBMC were sensitized with human myeloma IgE for 48 h in culture medium and were then stimulated for 30 min in Tyrode’s buffer (133 mM NaCl, 4 mM KCl, 0.64 mM KH2PO4, 10 mM HEPES, 1 g/L glucose, 1 mM CaCl2, 0.6 mM MgCl2, and 0.03% human serum albumin, pH 7.2). Tryptase was measured in the supernatant by fluoroenzyme-immunoassay (Amersham Pharmacia Biotech). Histamine levels in the supernatant and pellet were measured using a LS-5B Luminescence Spectrometer (PerkinElmer) as described (33). Histamine release was expressed as percentage of the total cellular histamine content = ((histamine in supernatant)/(histamine in supernatant + histamine in pellet)) × 100. For stimulation of cytokine production, HMC-1 (2 × 105 cells/200 μl) and hCBMC (105 cells/200 μl) were distributed to 96-well microtiter assay plates in duplicate or triplicate and stimulated in complete culture medium for the indicated concentrations of CRH. Optimal concentrations were determined from the dose-response experiments. For determination of whether secreted VEGF was de novo synthesized, cells were pretreated with the inhibitor of transcription actinomycin D (8 μM; Sigma-Aldrich) or the inhibitor of protein synthesis cycloheximide (50 μM; Sigma-Aldrich) for 30 min at 37°C before stimulation with CRH. Cytokines were determined in cell-free supernatants with commercial ELISA kit (R&D Systems) according to the manufacturer’s directions. Cytokine secretion data were expressed as picograms per 106 cells. The data are represented as the mean ± SEM from three or more experiments, each in duplicate or triplicate. For hCBMC, three or more separate experiments were done using mast cells derived from three or more different cord blood donors. Data were analyzed with the Student’s t test, Mann-Whitney U test, and ANOVA followed by the Holm-Sidak test or Newman-Keuls test as appropriate. Statistical significance was considered for p < 0.05. To determine the purity of hCBMC, we conducted immunohistochemistry staining for the specific mast cell granule-stored protease, tryptase. In our cultures, by 12 wk 100% of the cells were identified as mast cells (data not shown). These hCBMC (12–16 wk of culture with 100% mast cell purity) were used for our study. RT-PCR analysis showed that HMC-1 cells express specific mRNA for multiple CRH-R1 isoforms, including CRH-R1α, 1β, 1c, 1e, 1f, and 1g (Fig. 1⇓, a–c). CRH-R1α was the most abundant, 1c and 1e were prominent, whereas 1β, 1f, and 1g were faint. Similar studies in hCBMC showed that CRH-R1α, 1β, 1c, 1e, and 1f were present; CRH-R1g was absent (Fig. 1⇓, d–f). CRH-R1d was not detected in either HMC-1 or hCBMC (data not shown). Positive control used for CRH-R1d was the human melanoma SKMEL188 cell line that only expresses CRH-R1d. RT-PCR and nested PCR analysis of CRH-R1 isoforms mRNA in HMC-1 cells (a–c) and hCBMC (d–f). Total RNA was extracted from HMC-1 cells and hCBMC and subjected to RT-PCR (a and d) and nested PCR (b, c, e, and f) analysis. Positive controls used commercially available cDNA. a and d, Human brain pituitary positive control for R1α (lane 1) and human mast cells (lane 2); human brain pituitary positive control for R1β (lane 3) and human mast cells (lane 4); and negative control (reaction mixture without DNA template) (lane 5) are shown. M, DNA size marker. b and e, Nested PCR amplification of human CRH-R1 exons 2–7. Human brain pituitary positive control for R1α, R1c, and R1e (lane 1) and human mast cells (lane 2) are shown. c and f, Nested PCR amplification of human CRH-R1 exons 9–14. Human brain pituitary positive control for R1α, R1f, and R1g (lane 1) and human mast cells (lane 2) are shown. RT-PCR for CRH-R2 isoforms showed that HMC-1 cells do not express any (Fig. 2⇓, a–c), whereas hCBMC expressed only CRH-R2α (Fig. 2⇓, d–f). The PCR products were purified using QIAQuick PCR purification kit (Qiagen) and sequenced forward and reverse on ABI 3100 DNA sequencer at Tufts University Core Facility (Boston, MA). The sequencing results confirmed the identity and specificity of the PCR products. 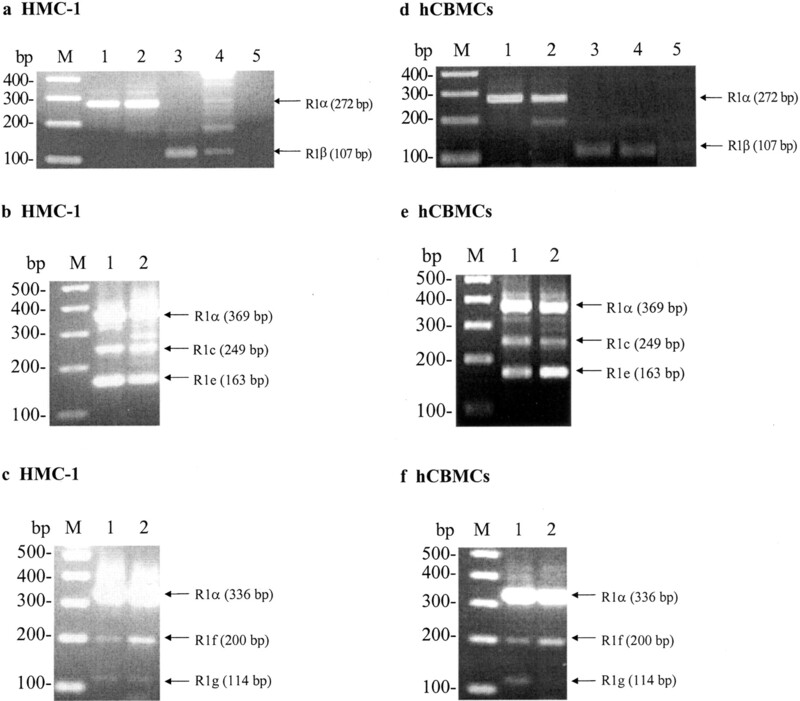 RT-PCR analysis of CRH-R2 isoforms mRNA in HMC-1 cells (a–c) and hCBMC (d–f). Total RNA was extracted from HMC-1 cells and hCBMC and subjected to RT-PCR analysis. Positive controls used were commercially available cDNA. Human brain cerebral cortex cDNA was used as positive control for CRH-R2α; human brain hippocampus cDNA was used as positive control for CRH-R2β and CRH-R2γ. Positive control (lane 1), human mast cells (lane 2), and negative control (lane 3) are shown. PCR amplification products using primers for β-actin as a housekeeping gene did not show any variation in the cDNA content among these samples; negative controls in which the reverse transcriptase was omitted to exclude any nuclear DNA contamination, or the reaction mixture without DNA template to exclude any system contamination, did not show any amplification product (data not shown). Immunoblotting analysis was used to detect CRH receptor protein expression in HMC-1 cells and hCBMC. SDS-PAGE of whole cell lysates from both cell types was performed using Abs that specifically recognize CRH-R1 or CRH-R2. Whole cell lysate from HaCaT cells, an immortalized human keratinocyte cell line that is known to express CRH-R1 (34), was used as a positive control. The Ab to CRH-R1 yielded a predominant band of ∼45 kDa in both HMC-1 and hCBMC and another band of ∼70 kDa in HMC-1. A single band of 47 kDa was detected in HaCaT cells as reported previously (34) (Fig. 3⇓a). The specificity of the response was confirmed by preincubation of the CRH-R1 Ab with the CRH-R1 blocking peptide. Upon preabsorption with this peptide, the bands in all samples disappeared, confirming that the bands were specific for the CRH-R1 (Fig. 3⇓b). Immunoblotting for CRH-R2 identified a strong band of 49 kDa and a minor band of ∼59 kDa only in hCBMC (Fig. 3⇓c), which disappeared after pretreatment with the CRH-R2 blocking peptide (Fig. 3⇓d). 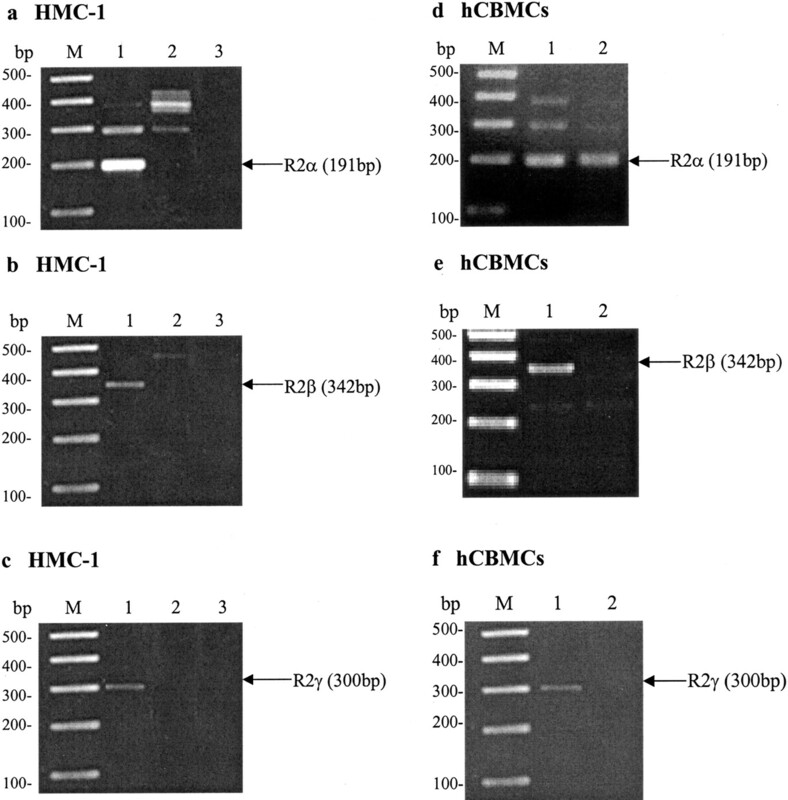 Western blot analysis of CRH-R1 (a and b) and CRH-R2 (c and d) in HMC-1 cells and hCBMC. hCBMC, HMC-1, and HaCaT cells were collected, lysed and samples of the whole cell lysates were run on 10% SDS-PAGE. hCBMC (lane 1), HMC-1 cells (lane 2), and HaCaT cells (lane 3) are shown. b and d, Membranes were stripped and the membrane proteins were analyzed with the anti-CRH-R1 Ab preabsorbed with the CRH-R1 blocking peptide (b) and the anti-CRH-R2 Ab preabsorbed with the CRH-R2 blocking peptide (d). HMC-1 (e) and hCBMC (f and g) were collected and membrane, cytosolic, and nuclear fraction were prepared as described in Materials and Methods. Equal amounts of protein were run on 10% SDS-PAGE. Membrane fraction (lane 1), cytosolic fraction (lane 2), and nuclear fraction (lane 3) are shown. CRH-R1 was detected in membrane fractions of HMC-1 (e) and h CBMC (f); CRH-R2 was detected in membrane fraction of hCBMC (g). MW, molecular weight marker. CRH receptors belong to the family of seven transmembrane G protein-coupled receptors (11). We proceeded to examine whether CRH-R1 and CRH-R2 proteins are present in the membranes of human mast cells. Membrane, cytosolic, and nuclear fractions of the cells were collected, and equal amounts of protein from all fractions were analyzed by SDS-PAGE. Again, CRH-R1 was detected only in the membrane fractions of both cell types as a 45-kDa protein (Fig. 3⇑e, HMC-1 and Fig. 3⇑f, hCBMC) with another band of ∼70 kDa in HMC-1 cells. CRH-R2 was detected as a 49 kDa protein with a minor band at ∼59 kDa only in the membrane fraction of hCBMC (Fig. 3⇑g). The specificity of the response was again confirmed by preincubation of the CRH-R1 or CRH-R2 Ab with the corresponding blocking peptide (data not shown). The results suggest that CRH-R1 and CRH-R2 are membrane receptors in human mast cells. CRH has been shown to exert its effects through binding to CRH receptor and activation of adenylate cyclase. To investigate whether the CRH-R1 on HMC-1 and hCBMC or CRH-R2 on hCBMC is functional, cAMP production was measured following stimulation with CRH. Incubation of HMC-1 cells with CRH (100 nM) increased intracellular cAMP significantly by 1.75 ± 0.12-fold (n = 6, p < 0.05) at 1 min, with a maximum of 2.0 ± 0.07-fold (n = 6, p < 0.05) at 3 min; thereafter, the cAMP levels decreased slowly, but still remained above basal values up to 1 h (Fig. 4⇓a). The level of cAMP in forskolin-treated cells increased from 3.0 ± 0.45-fold at 1 min to 15.0 ± 0.32-fold at 30 min (n = 6, p < 0.05) (data not shown), indicating that the adenylate cyclase system in cells was intact. 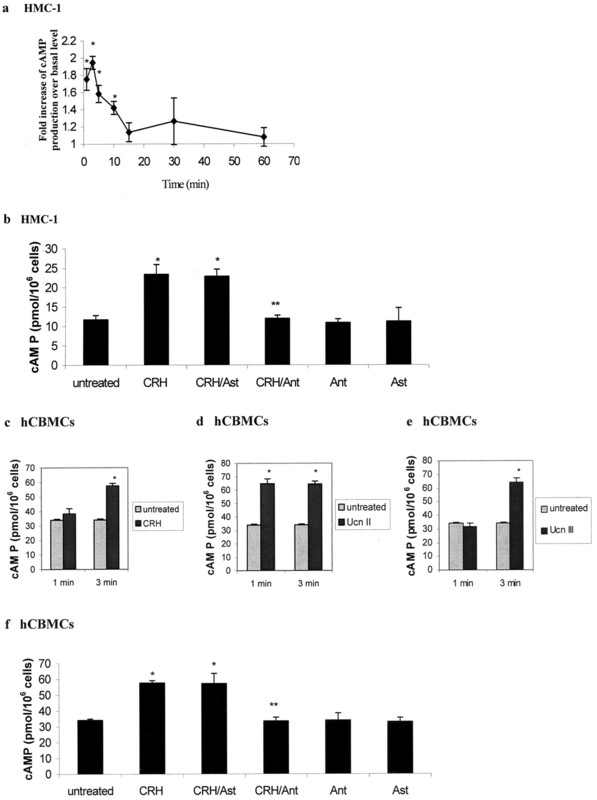 Pretreatment of HMC-1 for 10 min with the selective CRH-R1 antagonist antalarmin (1 μM) significantly reduced cAMP to basal levels (n = 6, p < 0.05), whereas the selective CRH-R2 antagonist astressin 2B (1 μM) did not have any effect on cAMP (Fig. 4⇓b); there was no effect even at higher concentrations (5–100 μM) (data not shown), confirming that CRH-R2 is not present in HMC-1 cells and indicating that CRH-induced cAMP increase was mediated through CRH-R1. Effect of CRH on cAMP production in HMC-1 cells and hCBMC. a and c–e, Cells were stimulated with either CRH or urocortin (Ucn II or Ucn III) (100 nM) in serum-free stimulation buffer, and intracellular cAMP levels were then measured by specific RIA at the indicated time points. b, Pretreatment of HMC-1 cells for 10 min with the selective CRH receptor antagonists followed by CRH (100 nM) stimulation. f, Pretreatment of hCBMC for 10 min with the selective CRH receptor antagonists (1 μM) followed by CRH (100 nM) stimulation. Ant, antalarmin; Ast, astressin 2B. Data are the mean ± SEM (n = 6). ∗, p < 0.05 vs control, ∗∗, p < 0.05 vs CRH. Similar studies were conducted in hCBMC, but due to the shortage of the cells, cAMP levels were only measured at 1 and 3 min. Incubation of hCBMC with 100 nM CRH (Fig. 4⇑c), as well as the specific CRH-R2 agonists urocortin II (Fig. 4⇑d) or urocortin III (Fig. 4⇑e) increased cAMP significantly (n = 6, p < 0.05) at 3 min. Pretreatment of hCBMC for 10 min with antalarmin (1 μM) reduced the effect of CRH on cAMP increase to basal levels (Fig. 4⇑f), whereas astressin 2B (1 μM) completely blocked the effects of urocortin II/III (data not shown). In contrast, pretreatment of cells with astressin 2B (1 μM) had no effect on CRH-induced cAMP elevation (Fig. 4⇑f), not even at higher concentrations (5–100 μM) (data not shown), indicating that cAMP could be selectively increased by CRH through CRH-R1. The antagonists alone at the concentrations used did not alter basal cAMP levels in either HMC-1 or hCBMC. Stimulation of the cells with CRH caused a dose-dependent (24 h incubation) and time-dependent release of VEGF from both HMC-1 (Fig. 5⇓, a and b) and hCBMC (Fig. 5⇓, c and d). Secretion was blocked by preincubating cells with antalarmin (1 μM), but not with astressin 2B (1 μM) (Fig. 5⇓, e and f). Higher concentrations of astressin 2B (5–100 μM) also had no effect. HMC-1 cells treated with PMA (25 ng/ml) plus calcium ionophore A23187 (250 nM), as a positive control for VEGF release, secreted 4540.2 ± 220.6 pg of VEGF per 106 cells (n = 6), ∼20-fold increase compared with the untreated control. Human myeloma IgE-sensitized hCBMC for 24 h challenged with anti-IgE for another 24 h as a positive control, released 88.9 ± 2.1 pg of VEGF per 106 cells (n = 6), ∼27% increase in comparison with the untreated control (data not shown). The delayed time course of VEGF secretion (6 h earliest increase) suggested that CRH stimulated de novo synthesis of VEGF. Indeed, VEGF production was completely inhibited by pretreatment (30 min) with the inhibitor of protein synthesis, cycloheximide (50 μM), in both HMC-1 (Fig. 5⇓b) (100% inhibition; n = 3) and hCBMC (Fig. 5⇓d) (100% inhibition; n = 3). Similar results were obtained using the inhibitor of transcription, actinomycin D (8 μM) (data not shown). Taken together, these results suggest that CRH selectively activated CRH-R1 for VEGF release in both HMC-1 and hCBMC, and VEGF was synthesized de novo. CRH stimulates VEGF secretion in HMC-1 cells and hCBMC. Dose-dependent secretion of VEGF in HMC-1 cells (a) and hCBMC (c). Cells were plated in 96-well plates and stimulated with CRH (24 h incubation) in a dose-dependent manner in complete culture media. Time-dependent secretion of VEGF in HMC-1 cells (b) and hCBMC (d). Cells were plated in 96-well plates and stimulated with CRH in a time-dependent manner (CRH 100 nM for HMC-1 and 1 μM for hCBMC) in complete culture media. Additionally, the CRH-stimulated and the unstimulated release of VEGF was monitored in the presence of 50 μM cycloheximide. Pretreatment of cells with antalarmin (1 μM) or astressin 2B (1 μM) followed by CRH (100 nM) stimulation for 24 h in HMC-1 (e) and hCBMC (f). Ant, antalarmin; Ast, astressin 2B. Data are the mean ± SEM (n = 6). ∗, p < 0.05 vs control, ∗∗, p < 0.05 vs CRH. We next investigated whether VEGF secretion was accompanied by tryptase and histamine release, which are two of the major granule-stored mediators in mast cells. hCBMC were stimulated with CRH at 100 nM for 30 min. Tryptase and histamine secretion in response to stimulation with anti-IgE (10 μg/ml) was used as a positive control. Tryptase and histamine secretion was similar between untreated control and CRH-treated cells (Fig. 6⇓, a and b). Similar results were obtained from HMC-1 cells, using PMA (25 ng/ml) plus calcium ionophore A23187 (0.5 μg/ml) treated cells as a positive control (data not shown). These results were further confirmed in both cells treated with different concentrations of CRH and by extending the time period to 3, 6, and 24 h for tryptase and histamine release measurements (data not shown). Moreover, there was no release of IL-6, IL-8, or TNF-α under these conditions in both hCBMC (Fig. 6⇓, c–e; note that the SEM for IL-6 values was large in this cell type) and HMC-1 cells (Fig. 6⇓, f–h). In addition, CRH did not enhance the effect of anti-IgE on mediator release in hCBMC (Fig. 6⇓, a–e) or the effect of IL-1 or PMA plus calcium ionophore on mediator release in HMC-1 (Fig. 6⇓, f–h). These data demonstrate that CRH induced selective release of VEGF in human mast cells in the absence of concomitant tryptase and histamine secretion and IL-6, IL-8, or TNF-α release. CRH selectively stimulates production of VEGF without tryptase, histamine, IL-6, IL-8, and TNF-α release. Tryptase (a) and histamine (b) secretion by hCBMC in response to stimulation with anti-IgE (10 μg/ml) in the presence or absence of CRH (100 nM). Cells were stimulated for 30 min for tryptase and histamine measurements. IL-6 (c), IL-8 (d), and TNF-α (e) release by hCBMC in response to stimulation with anti-IgE (10 μg/ml) in the presence or absence of CRH (100 nM) for 6 h. IL-6 (f), IL-8 (g), and TNF-α (h) release by HMC-1 cells in response to stimulation with IL-1 (10 ng/ml) or PMA (25 ng/ml) plus A23187 (0.5 μg/ml) in the presence or absence of CRH (100 nM) for 6 h. P, PMA; A, A23187. Data are the mean ± SEM (n = 4). ∗, p < 0.05 vs control. CRH binding to CRH-R1 typically activates adenylate cyclase leading to increased intracellular concentrations of cAMP (11). Because we showed that CRH-stimulated VEGF release was CRH-R1-dependent and CRH significantly increased cAMP in both HMC-1 and hCBMC, we proceeded to investigate whether cAMP is involved in CRH-mediated VEGF production. 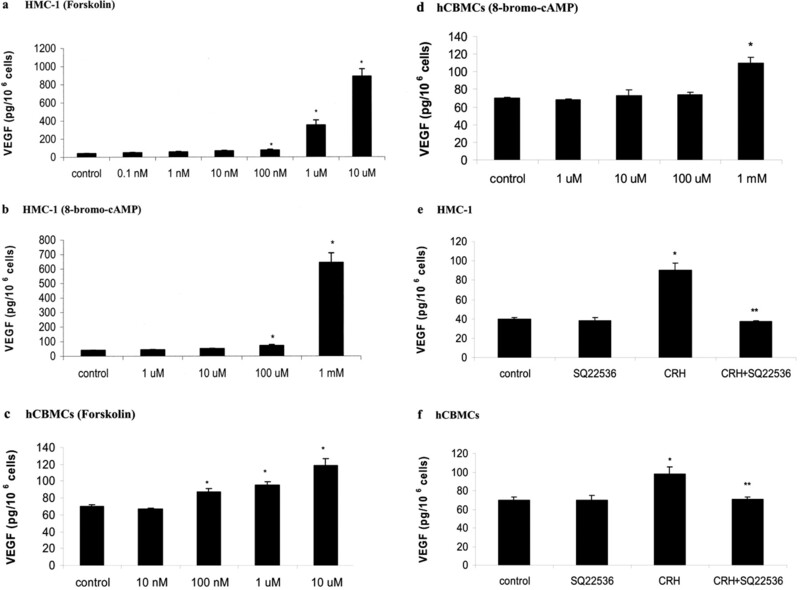 Forskolin, a direct activator of adenylate cyclase, and 8-bromo-cAMP, a cell-permeable cAMP analog mimicked the effect of CRH and induced strong VEGF secretion in both HMC-1 (Fig. 7⇓, a and b) and hCBMC (Fig. 7⇓, c and d) in a dose-dependent manner. We then stimulated cells with CRH in the presence or absence of SQ22536, an adenylate cyclase inhibitor. The effect of CRH on VEGF production was completely abolished with SQ22536 at the concentration of 8 mM (Fig. 7⇓, e and f). SQ22536 at this concentration did not alter the basal level of VEGF production in both cells. 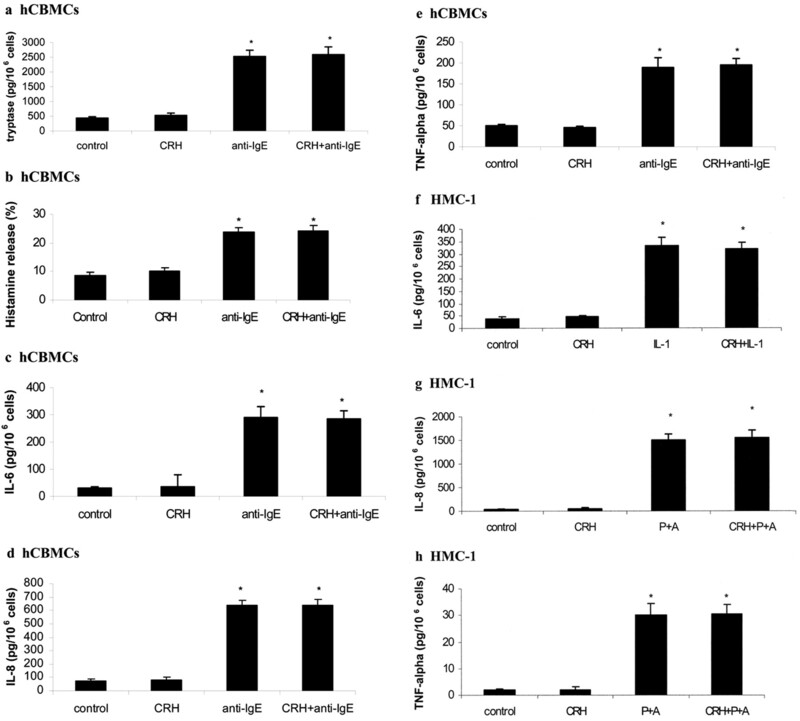 HMC-1 cells treated with forskolin (1 μM) for 6 h and hCBMC treated with forskolin (10 μM) for 24 h were used as positive controls for adenylate cyclase activation. SQ22536 (8 mM) significantly reduced forskolin-induced VEGF release in HMC-1 cells from 334.1 ± 45.9 pg per 106 cells to 54.8 ± 3.6 pg per 106 cells, comparable to untreated control (n = 4, p < 0.05). Similar results were observed in hCBMC in which VEGF production was significantly reduced from 119.4 ± 7.8 pg per 106 cells to 71.6 ± 2.5 pg per 106 cells (n = 4, p < 0.05). Our results strongly suggest that CRH stimulates VEGF production in human mast cells through CRH-R1-dependent activation of adenylate cyclase and increased cAMP. CRH-stimulated VEGF production is mediated through cAMP. 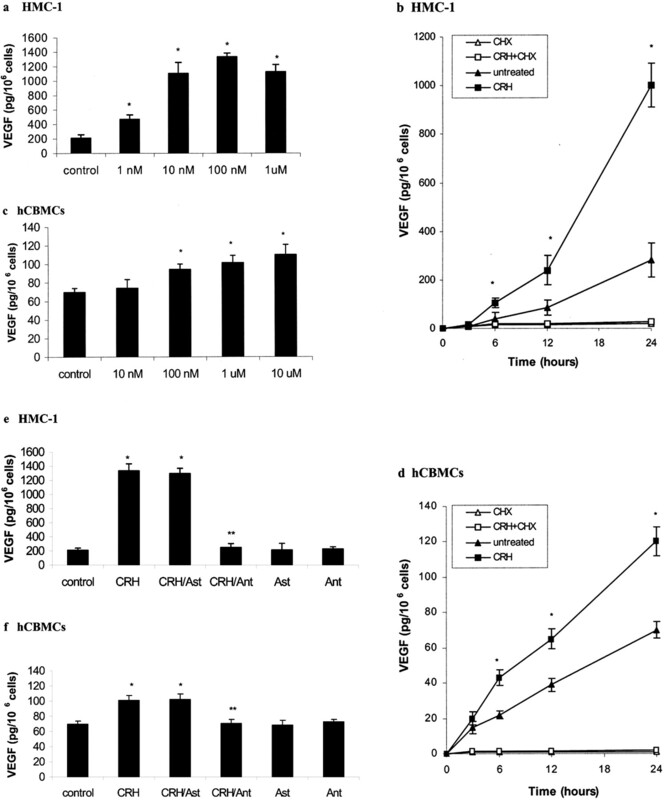 Dose-dependent secretion of VEGF in HMC-1 cells (a and b) and hCBMC (c and d) in response to forskolin (a and c) and 8-bromo-cAMP (b and d). Cells were plated in 96-well plates and stimulated with forskolin or 8-bromo-cAMP as indicated in a dose-dependent manner (6 h incubation for HMC-1 and 24 h incubation for hCBMC) in complete culture media. The effect of SQ22536 on CRH-induced VEGF production in HMC-1 cells (e) and hCBMC (f) is shown. Cells were plated in 96-well plates and preincubated with SQ22536 (8 mM) for 1 h before stimulation with CRH (100 nM for HMC-1 and 1 μM for hCBMC) for another 6 h (HMC-1) or 24 h (hCBMC) in complete culture media. Data are the mean ± SEM (n = 4). ∗, p < 0.05 vs control, ∗∗, p < 0.05 vs CRH. To our knowledge, this is the first report that mRNA of multiple CRH receptor isoforms is expressed in human mast cells. Moreover, CRH-R1 protein is present and functional in HMC-1, whereas both CRH-R1 and CRH-R2 are functional in hCBMC, as evidenced by a significant increase of cAMP production induced by CRH or the specific CRH-R2 agonists urocortin II or urocortin III, respectively. This is also the first time that CRH is shown to stimulate selective secretion of VEGF without tryptase and histamine or cytokines IL-6, IL-8, or TNF-α. The SEM of IL-6 release in hCBMC was fairly large, possibly due to different batches of hCBMC from separate donors. Both cAMP and VEGF production induced by CRH were blocked by pretreatment with the specific CRH-R1 antagonist antalarmin, but not the specific CRH-R2 antagonist astressin 2B, indicating they were mediated through CRH-R1. Moreover, CRH activated adenylate cyclase, leading to an increase of cAMP that mediated VEGF production. The selective VEGF release could explain how mast cells participate in inflammatory processes in the absence of allergic stimulation or degranulation. Mouse and human mast cells had previously been shown to secrete both preformed and newly synthesized VEGF in response to allergic stimulation (27). Human leukemic and skin mast cells were also shown to constitutively express VEGF and could also further express VEGF 206, a vasodilatory isoform, upon prolonged stimulation (28). CRH-R1 mRNA expression had previously been reported in HMC-1, but was not characterized further (5). In this study we showed that in both HMC-1 and hCBMC, CRH-R1α is the most abundant, CRH-R1c and CRH-R1e were prominent, with CRH-R1β and CRH-R1f being faint. The CRH-R1d isoform was absent in both HMC-1 and hCBMC, whereas CRH-R1g was absent only in the latter. The lack of isoform-specific Abs did not allow us to test which of these receptor isoform proteins is expressed in HMC-1 or hCBMC. No function has so far been attributed to these isoforms in mast cells. The gene for human CRH-R1 contains 14 exons. Several splice variants of the mRNA for this receptor have been identified, encoding different isoforms, termed R1α, 1β, 1c, 1d, 1e, 1f, and 1g. CRH-R1β contains all 14 exons translating into a 444 amino acid protein, 1α lacks exon 6, 1c lacks exons 3 and 6, whereas 1d lacks exons 6 and 13. Exons 3 and 4 were spliced from CRH-R1e; exon 12 was spliced from CRH-R1f; exon 1, and 27 bp of exon 10 and 28 bp of exon 12 were spliced from CRH-R1g (13). The major ligand-binding determinant of mammalian CRH-R1 has been mapped to its first extracellular domain, coded by exons 1–4 of CRH-R1 (35). Exon 3 contains two regions that are critical for high-affinity ligand binding, and mutations in this region abolish CRH binding (36). CRH-R1α, 1f, and 1g encode the entire CRH-binding domain; they should, therefore, be the efficient receptor variants that bind and transduce peptide signals into cAMP-mediated pathways. In contrast, isoforms R1β, R1c, and R1e either have decreased ligand-binding capacity (β, c) or are poorly coupled to cAMP production (β, e) (36, 37, 38). COS cells were recently transfected with different CRH-R1 isoforms (39). It was shown that CRH-R1α was the only isoform coupled directly to adenylate cyclase, whereas CRH-R1g inhibited the activity of the cyclase regulatory element (39). Hence, different CRH receptor isoforms could link to different signaling pathways. Based on the amino acid sequence of CRH receptors, the predicted molecular mass values range between 45 and 53 kDa (40). Indeed, the CRH-R1 protein we detected by Western blot analysis in both HMC-1 and hCBMC is ∼45 kDa, and the CRH-R2 protein in hCBMC is ∼49 kDa. A single band of 47 kDa for CRH-R1 was detected in the HaCaT cells sample, consistent with a previous report (34). High molecular mass bands for CRH-R1 (∼70 kDa) and CRH-R2 (∼59 kDa) were detected in HMC-1 cells and hCBMC, respectively. These high molecular mass bands could be attributable to posttranslational modifications of the CRH receptors. Previous studies using immunoblotting analysis also showed that CRH receptors in human placenta had molecular mass of 55 kDa and 75 kDa (41, 42, 43). CRH-R1 of 59 and 72 kDa were identified in the rat and mouse pituitary membranes (44). In addition, the molecular weights of rat and mouse brain CRH-R1 were determined by Western blot analysis to be 80,000–76,000 and 83,000–79,000, respectively (44). AtT20 mouse pituitary tumor cells were reported to express CRH-R1 of 70 kDa (45). The different molecular mass values of the CRH receptor molecules point to a different regulation of the receptor modification in various tissues and cell types. Due to differences in the posttranslational modification of the proteins, the molecular mass of CRH receptors could differ from one tissue or cell type to another. CRH receptors belong to the family of seven transmembrane G protein-coupled receptors. Using Western blot analysis, we showed that CRH-R1 and CRH-R2 are membrane receptors in both cells because the receptors are present only in the membrane fractions of these cells. Our present findings showing selective VEGF release are seemingly different from the intradermal injection of CRH (5) that was shown to degranulate skin mast cells and increase vascular permeability. This apparent in vitro and in vivo discrepancy could be explained by preliminary evidence indicating that the intradermal effect of CRH leading to mast cell degranulation may involve the synergic effect of neurotensin (NT) (our unpublished observation) because pretreatment with an NT receptor antagonist blocked the intradermal effect of CRH (6). In other words, intradermal CRH may have two effects: 1) induction of VEGF release by a direct action on skin mast cells, and 2) induction of skin mast cell degranulation by stimulating release of NT from dorsal root ganglia nerve processes, which in turn stimulates mast cell degranulation. Our preliminary findings indicate that mouse dorsal root ganglia express NT (our unpublished observations), whereas receptors for NT were recently identified on rat mast cells (46). Our results showed that CRH-induced VEGF production by human mast cells is mediated through an increased intracellular cAMP because the direct adenylate cyclase activator forskolin and cell-permeable cAMP analog 8-bromo-cAMP mimicked the effect of CRH, and the adenylate cyclase inhibitor SQ22536 completely abolished CRH-induced VEGF production. Previous findings by other groups also suggested involvement of cAMP in VEGF production. For example, salbutamol, a β2-adrenoceptor agonist widely used as a bronchodilator in the treatment of asthma and known to elevate cAMP levels, induced an increase in VEGF production by hCBMC in a dose-dependent manner, as did forskolin (47). In addition, cAMP-elevating agents have been shown to stimulate VEGF production in macrophages (48). In contrast, cAMP could also have an inhibitory influence on mediator release. For example, a specific β2-adrenoceptor agonist inhibited the IgE-mediated release of tryptase and TNF-α production in hCBMC (49). One way to possibly reconcile these data would be that cAMP could have divergent effects on different intracellular processes. It has previously been reported that cAMP may have both inhibitory and stimulatory effects in the same cell type (50). Such seemingly opposing effects could be due to pleiotropic actions of CREB proteins (51). Once activated, these proteins bind to cAMP response elements of various genes and act either as positive regulators or dominant-negative inhibitors of transcription. Because the complement of CREB proteins differs among cell types and their effects are dependent upon the stimulus, CREB activation can produce a number of apparently conflicting effects. CRH profoundly influences neuroendocrine-immune interactions indirectly, through activation of the hypothalamic-pituitary-adrenal axis and release of glucocorticoids and catecholamines (4). Peripheral CRH secreted locally at inflammatory sites, however, could have autocrine or paracrine immunomodulatory actions (52), especially because mast cells secrete a large amount of CRH (29). Recent evidence, in fact, indicates that mast cells are involved in inflammatory diseases worsened by stress (3). For instance, mast cells are increased in psoriasis, the symptoms of which worsen by stress (53) and which has been associated with increased VEGF levels (54). Mast cells are also known to be involved in skin delayed hypersensitivity reactions (55) that are also associated with increased VEGF expression (56) and worsen by stress (53). Increased and activated mast cells have been documented in the bladder of patients with interstitial cystitis (57), an inflammatory condition recently associated with increased VEGF expression (58). Finally, mast cells are also increased (59) and express CRH-R1α in the joints of rheumatoid arthritis patients in which the expression of CRH-R1 and CRH-R2 mRNAs was detected by RT-PCR (23). Immunoreactive CRH (60) was also detected in the synovium of patients with rheumatoid arthritis reported to have increased VEGF (61). Inflammatory arthritis was also greatly reduced in CRH knockout mice (62), whereas collagen-induced arthritis was reduced by the CRH-R1 antagonist antalarmin (63). Our results support the premise that CRH could either initiate or potentiate inflammatory processes (3) by acting directly on mast cells to release VEGF selectively and with a time course different from that of anaphylactic reactions. Ongoing investigations address the biological significance of this phenomenon under inflammatory conditions. We thank Dr. J. H. Butterfield (Mayo Clinic, Rochester, MN) for kindly providing the HMC-1 cells, Dr. A. Slominski (University of Tennessee, Memphis, TN) for providing the HaCaT keratinocytes and human melanoma SKMEL188 cell line, and Amgen for the human recombinant stem cell factor. We are grateful to Dr. A. Athanassiou and the nurses of the Labor and Delivery Division, Tufts-New England Medical Center (Boston, MA), for umbilical cord blood collection. We also thank Jessica Christian for patience and word processing skills. ↵1 This work was supported in part by National Institutes of Health Grant AR47652 (to T.C.T.). ↵2 Current address: Division of Information Biology, Department of Biosystem Information Sciences, Tohoku University, Aramaki aza Aoba 09, Aoba-ku Sendai-city Miyagi-Pref., 980-8579, Japan. ↵4 Abbreviations used in this paper: CRH, corticotropin-releasing hormones; HMC-1, human leukemic mast cell line; hCBMC, human cord blood-derived mast cell; NT, neurotensin; VEGF, vascular endothelial growth factor. Kobayashi, H., T. Ishizuka, Y. Okayama. 2000. Human mast cells and basophils as sources of cytokines. Clin. Exp. Allergy 30: 1205-1212. Marone, G., S. J. Galli, Y. Kitamura. 2002. Probing the roles of mast cells and basophils in natural and acquired immunity, physiology and disease. Trends Immunol. 23: 425-427. Theoharides, T. C., D. E. Cochrane. 2004. Critical role of mast cells in inflammatory diseases and the effect of acute stress. J. Neuroimmunol. 146: 1-12. Chrousos, G. P.. 1995. The hypothalamic-pituitary-adrenal axis and immune-mediated inflammation. N. Engl. J. Med. 332: 1351-1362. Theoharides, T. C., L. K. Singh, W. Boucher, X. Pang, R. Letourneau, E. Webster, G. Chrousos. 1998. Corticotropin-releasing hormone induces skin mast cell degranulation and increased vascular permeability, a possible explanation for its proinflammatory effects. Endocrinology 139: 403-413. Theoharides, T. C., J. M. Donelan, N. Papadopoulou, J. Cao, D. Kempuraj, P. Conti. 2004. Mast cells as targets of corticotropin-releasing factor and related peptides. Trends Pharmacol. Sci. 25: 563-568. Chen, R., K. A. Lewis, M. H. Perrin, W. W. Vale. 1993. Expression cloning of a human corticotropin-releasing factor receptor. Proc. Natl. Acad. Sci. USA 90: 8967-8971. Liaw, C. W., T. W. Lovenberg, G. Barry, T. Oltersdorf, D. E. Grigoriadis, E. B. de Souza. 1996. Cloning and characterization of the human corticotropin-releasing factor-2 receptor complementary deoxyribonucleic acid. Endocrinology 137: 72-77. Lovenberg, T. W., C. W. Liaw, D. E. Grigoriadis, W. Clevenger, D. T. Charmers, E. B. de Souza, T. Oltersdorf. 1995. Cloning and characterization of a functionally distinct corticotropin-releasing factor receptor subtype from rat brain. Proc. Natl. Acad. Sci. USA 92: 836-840. Vita, N., P. Laurent, S. Lefort, P. Chalon, J. M. Lelias, M. Kaghad, G. Le Fur, D. Caput, P. Ferrara. 1993. Primary structure and functional expression of mouse pituitary and human brain corticotrophin releasing factor receptors. FEBS Lett. 335: 1-5. Grammatopoulos, D. K., G. P. Chrousos. 2002. Functional characteristics of CRH receptors and potential clinical applications of CRH-receptor antagonists. Trends Endocrinol. Metab. 13: 436-444. Ross, P. C., C. M. Kostas, T. V. Ramabhadran. 1994. A variant of the human corticotropin-releasing factor (CRF) receptor: cloning, expression and pharmacology. Biochem. Biophys. Res. Commun. 205: 1836-1842. Pisarchik, A., A. Slominski. 2001. Alternative splicing of CRH-R1 receptors in human and mouse skin: identification of new variants and their differential expression. FASEB J. 15: 2754-2756. Vamvakopoulos, N. C., T. O. Sioutopoulou. 1994. Human corticotropin-releasing hormone receptor gene (CRHR) is located on the long arm of chromosome 17 (17q12-qter). Chromosome Res. 2: 471-473. Valdenaire, O., T. Giller, V. Breu, J. Gottowik, G. Kilpatrick. 1997. A new functional isoform of the human CRF2 receptor for corticotropin-releasing factor. Biochim. Biophys. Acta 1352: 129-132. Kostich, W. A., A. Chen, K. Sperle, B. L. Largent. 1998. Molecular identification and analysis of a novel human corticotropin-releasing factor (CRF) receptor: the CRF2γ receptor. Mol. Endocrinol. 12: 1077-1085. Kishimoto, T., R. V. Pearse, II, C. R. Lin, M. G. Rosenfeld. 1995. A sauvagine/corticotropin-releasing factor receptor expressed in heart and skeletal muscle. Proc. Natl. Acad. Sci. USA 92: 1108-1112. Webster, E. L., D. E. Tracey, M. A. Jutila, S. A. Wolfe, Jr, E. B. de Souza. 1990. Corticotropin-releasing factor receptors in mouse spleen: identification of receptor-bearing cells as resident macrophages. Endocrinology 127: 440-452. Singh, V. K., H. H. Fudenberg. 1988. Binding of [125I]corticotropin releasing factor to blood immunocytes and its reduction in Alzheimer’s disease. Immunol. Lett. 18: 5-8. Audhya, T., R. Jain, C. S. Hollander. 1991. Receptor-mediated immunomodulation by corticotropin-releasing factor. Cell Immunol. 134: 77-84. Mousa, S. A., C. P. Bopaiah, C. Stein, M. Schafer. 2003. Involvement of corticotropin-releasing hormone receptor subtypes 1 and 2 in peripheral opioid-mediated inhibition of inflammatory pain. Pain 106: 297-307. McEvoy, A. N., B. Bresnihan, O. FitzGerald, E. P. Murphy. 2001. Corticotropin-releasing hormone signaling in synovial tissue from patients with early inflammatory arthritis is mediated by the type 1α corticotropin-releasing hormone receptor. Arthritis Rheum. 44: 1761-1767. Singh, L. K., X. Pang, N. Alexacos, R. Letourneau, T. C. Theoharides. 1999. Acute immobilization stress triggers skin mast cell degranulation via corticotropin releasing hormone, neurotensin and substance P: a link to neurogenic skin disorders. Brain Behav. Immunity 13: 225-239. Santos, J., P. R. Saunders, N. P. Hanssen, P. C. Yang, D. Yates, J. A. Groot, M. H. Perdue. 1999. Corticotropin-releasing hormone mimics stress-induced colonic epithelial pathophysiology in the rat. Am. J. Physiol. 277: G391-G399. Castagliuolo, I., J. T. LaMont, B. Qiu, S. M. Fleming, K. R. Bhaskar, S. T. Nikulasson, C. Kornetsky, C. Pothoulakis. 1996. Acute stress causes mucin release from rat colon: role of corticotropin releasing factor and mast cells. Am. J. Physiol. 271:(5 Pt. 1): G884-G892. Norrby, K.. 2002. Mast cells and angiogenesis. APMIS 110: 355-371. Boesiger, J., M. Tsai, M. Maurer, M. Yamaguchi, L. F. Brown, K. P. Claffey, H. F. Dvorak, S. J. Galli. 1998. Mast cells can secrete vascular permeability factor/vascular endothelial cell growth factor and exhibit enhanced release after immunoglobulin E-dependent upregulation of Fcε receptor I expression. J. Exp. Med. 188: 1135-1145. Grützkau, A., S. Krüger-Krasagakes, H. Baumeister, C. Schwarz, H. Kögel, P. Welker, U. Lippert, B. M. Henz, A. Möller. 1998. Synthesis, storage and release of vascular endothelial growth factor/vascular permeability factor (VEGF/VPF) by human mast cells: implications for the biological significance of VEGF206. Mol. Biol. Cell. 9: 875-884. Kempuraj, D., N. G. Papadopoulou, M. Lytinas, M. Huang, K. Kandere-Grzybowska, B. Madhappan, W. Boucher, S. Christodoulou, A. Athanassiou, T. C. Theoharides. 2004. Corticotropin-releasing hormone and its structurally related urocortin are synthesized and secreted by human mast cells. Endocrinology 145: 43-48. Kempuraj, D., H. Saito, A. Kaneko, K. Fukagawa, M. Nakayama, H. Toru, M. Tomikawa, H. Tachimoto, M. Ebisawa, A. Akasawa, et al 1999. Characterization of mast cell-committed progenitors present in human umbilical cord blood. Blood 93: 3338-3346. Slominski, A. T., B. Roloff, B. Zbytek, E. T. Wei, K. Fechner, J. Curry, J. Wortsman. 2000. Corticotropin releasing hormone and related peptides can act as bioregulatory factors in human keratinocytes. In Vitro Cell. Dev. Biol. Anim. 36: 211-216. Florio, P., A. Franchini, F. M. Reis, I. Pezzani, E. Ottaviani, F. Petraglia. 2000. Human placenta, chorion, amnion and decidua express different variants of corticotropin-releasing factor receptor messenger RNA. Placenta 21: 32-37. Kremzner, L. T., J. B. Wilson. 1961. A procedure for the determination of histamine. Biochim. Biophys. Acta 50: 364-367. Quevedo, M. E., A. Slominski, W. Pinto, E. Wei, J. Wortsman. 2001. Pleiotropic effects of corticotropin releasing hormone on normal human skin keratinocytes. In Vitro Cell. Dev. Biol. Anim. 37: 50-54. Perrin, M. H., S. Sutton, D. L. Bain, W. T. Berggren, W. W. Vale. 1998. The first extracellular domain of corticotropin releasing factor-R1 contains major binding determinants for urocortin and astressin. Endocrinology 139: 566-570. Wille, S., S. Sydow, M. R. Palchaudhuri, J. Spiess, F. M. Dautzenberg. 1999. Identification of amino acids in the N-terminal domain of corticotropin-releasing factor receptor 1 that are important determinants of high-affinity ligand binding. J. Neurochem. 72: 388-395. Grammatopoulos, D. K., Y. Dai, H. S. Randeva, M. A. Levine, E. Karteris, A. J. Easton, E. W. Hillhouse. 1999. A novel spliced variant of the type 1 corticotropin-releasing hormone receptor with a deletion in the seventh transmembrane domain present in the human pregnant term myometrium and fetal membranes. Mol. Endocrinol. 13: 2189-2202. Nabhan, C., Y. Xiong, L. Y. Xie, A. B. Abou-Samra. 1995. The alternatively spliced type II corticotropin-releasing factor receptor, stably expressed in LLCPK-1 cells, is not well coupled to the G protein(s). Biochem. Biophys. Res. Commun. 212: 1015-1021. Pisarchik, A., A. Slominski. 2004. Molecular and functional characterization of novel CRFR1 isoforms from the skin. Eur. J. Biochem. 271: 2821-2830. Esposito, P., S. Basu, R. Letourneau, S. Jacobson, T. C. Theoharides. 2003. Corticotropin-releasing factor (CRF) can directly affect brain microvessel endothelial cells. Brain Res. 968: 192-198. Karteris, E., A. Goumenou, E. Koumantakis, E. W. Hillhouse, D. K. Grammatopoulos. 2003. Reduced expression of corticotropin-releasing hormone receptor type-1 α in human preeclamptic and growth-restricted placentas. J. Clin. Endocrinol. Metab. 88: 363-370. Saeed, B. O., D. R. Weightman, C. H. Self. 1997. Characterization of corticotropin-releasing hormone binding sites in the human placenta. J. Recept. Signal Transduct. Res. 17: 647-666. Clifton, V. L., P. C. Owens, P. J. Robinson, R. Smith. 1995. Identification and characterization of a corticotrophin-releasing hormone receptor in human placenta. Eur. J. Endocrinol. 133: 591-597. Radulovic, J., S. Sydow, J. Spiess. 1998. Characterization of native corticotropin-releasing factor receptor type 1 (CRFR1) in the rat and mouse central nervous system. J. Neurosci. Res. 54: 507-521. Nishimura, E., N. Billestrup, M. Perrin, W. Vale. 1987. Identification and characterization of a pituitary corticotropin-releasing factor binding protein by chemical cross-linking. J. Biol. Chem. 262: 12893-12896. Feldberg, R. S., D. E. Cochrane, R. E. Carraway, E. B. Brown, R. Sawyer, M. Hartunian, D. Wentworth. 1998. Evidence for a neurotensin receptor in rat serosal mast cells. Inflamm. Res. 47: 245-250. Abdel-Majid, R. M., J. S. Marshall. 2004. Prostaglandin E2 induces degranulation-independent production of vascular endothelial growth factor by human mast cells. J. Immunol. 172: 1227-1236. Sunderkotter, C., K. Steinbrink, M. Goebeler, R. Bhardwaj, C. Sorg. 1994. Macrophages and angiogenesis. J. Leukocyte Biol. 55: 410-422. Suzuki, H., A. Ueno, M. Takei, K. Shindo, T. Higa, H. Fukamachi. 2000. The effects of S1319, a novel marine sponge-derived β2-adrenoceptor agonist, on IgE-mediated activation of human cultured mast cells. Inflamm. Res. 49: 86-94. Vazquez, A., M. T. Auffredou, P. Galanaud, G. Leca. 1991. Modulation of IL-2- and IL-4-dependent human B cell proliferation by cyclic AMP. J. Immunol. 146: 4222-4227. Karin, M., T. Smeal. 1992. Control of transcription factors by signal transduction pathways: the beginning of the end. Trends Biochem. Sci. 17: 418-422. Karalis, K., H. Sano, J. Redwine, S. Listwak, R. L. Wilder, G. P. Chrousos. 1991. Autocrine or paracrine inflammatory actions of corticotropin-releasing hormone in vivo. Science 254: 421-423. Katsarou-Katsari, A., A. Filippou, T. C. Theoharides. 1999. Effect of stress and other psychological factors on the pathophysiology and treatment of dermatoses. Int. J. Immunopathol. Pharmacol. 12: 7-11. Xia, Y. P., B. Li, D. Hylton, M. Detmar, G. D. Yancopoulos, J. S. Rudge. 2003. Transgenic delivery of VEGF to mouse skin leads to an inflammatory condition resembling human psoriasis. Blood 102: 161-168. Charlesworth, E. N.. 1995. Role of basophils and mast cells in acute and late reactions in the skin. Chem. Immunol. 62: 84-107. Kunstfeld, R., S. Hirakawa, Y. K. Hong, V. Schacht, B. Lange-Asschenfeldt, P. Velasco, C. Lin, E. Fiebiger, X. Wei, Y. Wu, et al 2004. Induction of cutaneous delayed-type hypersensitivity reactions in VEGF-A transgenic mice results in chronic skin inflammation associated with persistent lymphatic hyperplasia. Blood 104: 1048-1057. Theoharides, T. C., D. Kempuraj, G. R. Sant. 2001. Mast cell involvement in interstitial cystitis: a review of human and experimental evidence. Urology 57: 47-55. Tamaki, M., R. Saito, O. Ogawa, N. Yoshimura, T. Ueda. 2004. Possible mechanisms inducing glomerulations in interstitial cystitis: relationship between endoscopic findings and expression of angiogenic growth factors. J. Urol. 172: 945-948. Olsson, N., A. K. Ulfgren, G. Nilsson. 2001. Demonstration of mast cell chemotactic activity in synovial fluid from rheumatoid patients. Ann. Rheum. Dis. 60: 187-193. Nishioka, T., H. Kurokawa, T. Takao, Y. Kumon, K. Nishiya, K. Hashimoto. 1996. Differential changes of corticotropin releasing hormone (CRH) concentrations in plasma and synovial fluids of patients with rheumatoid arthritis (RA). Endocr. J. 43: 241-247. Paavonen, K., J. Mandelin, T. Partanen, L. Jussila, T. F. Li, A. Ristimaki, K. Alitalo, Y. T. Konttinen. 2002. Vascular endothelial growth factors C and D and their VEGFR-2 and 3 receptors in blood and lymphatic vessels in healthy and arthritic synovium. J. Rheumatol. 29: 39-45. Mattheos, S., S. Christodoulou, D. Kempuraj, B. Kempuraj, K. Karalis, T. C. Theoharides. 2003. Mast cells and corticotropin-releasing hormone (CRH) are required for experimental inflammatory arthritis C44 The American Association of Immunologists. The 90th Anniversary Meeting. May 6–10. Colorado Convention Center Denver, CO. .
Webster, E. L., R. M. Barrientos, C. Contoreggi, M. G. Isaac, S. Ligier, K. E. Gabry, G. P. Chrousos, E. F. McCarthy, K. C. Rice, P. W. Gold, E. M. Sternberg. 2002. Corticotropin releasing hormone (CRH) antagonist attenuates adjuvant induced arthritis: role of CRH in peripheral inflammation. J. Rheumatol. 29: 1252-1261.